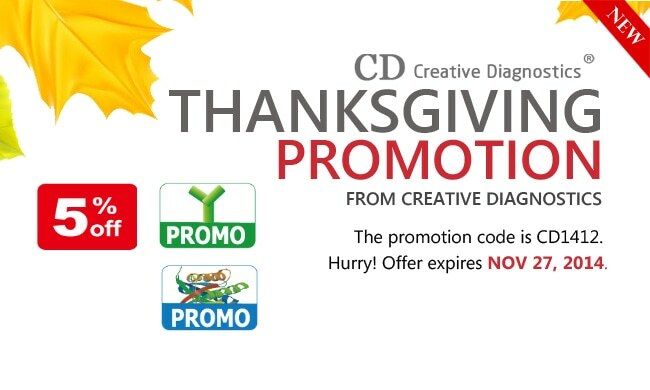 Thanksgiving comes with Creative Diagnostics antibody promotions! β-actin antibody (CABT-L1115) and GAPDH antibody (DMAB-DCC167) with extremely high titer are $99 each for a 50ul size vial. The promotion code is CDCA1230. This promotion is valid until December 31, 2017. Greetings from Creative Diagnostics! CD is very thankful for all of your continued patronage, and look forward to serving you for years to come. Save 10% on our popular elisa kits; Buy one antibody, get one matched antigen free on our small molecule antibodies. The Promotion code is CDTG1130. Offer expires Dec 16, 2016. There are over 700 preservative free secondary antibodies with bulk size in the Creative Diagnostics catalog included in the promotion. You can get 20% off your first order in 2016. Our special offer ends Jan 31st, so order now to avoid missing out. Creative Diagnostics Promotion for purchasing antibody and antigen products, rapid test kits. Valid until for Oct 30, 2015. Purchase any hybridomas product, you will get a 15% discount, 30% off to buy another hybridomas product for every $5,000 order. 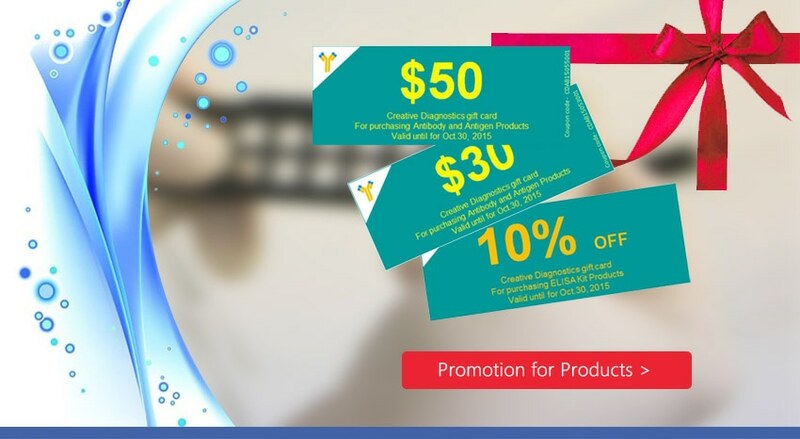 Promotion code is “CD1504”, valid from April 1st, 2015 to May 1st,2015. Have a happy Thanksgiving! Creative Diagnostics is happily offering a promotion to thank you for all your support and business in 2014. The promotion code is CD1412. Hurry! Offer expires Nov 27, 2014. Purchase any antibody product, you will get a 20% discount. 30% off to buy another antibody product for every $5,000 order. Promotion code is "Ab2014". 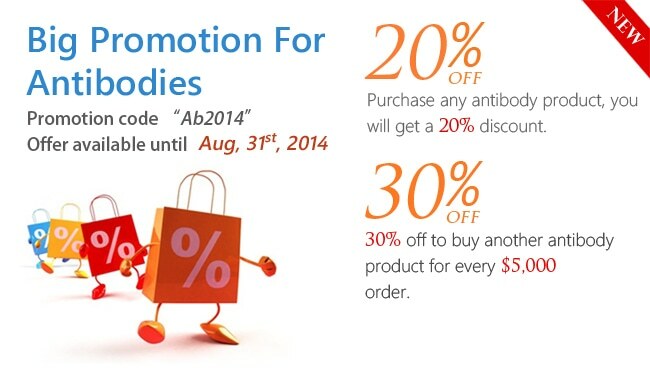 The promotion for antibodies is valid from July 1st, 2014 to August 30th, 2014.